Thanksgiving is come and gone. Annalisa Merelli’s piece for Quartz, regarding what the US body politic and the US media can learn from Italy’s experiences with Silvio Berlusconi. Namely, that fighting the man does little good, because as Trump has said: All publicity is good publicity. (And the man is a reality TV star, he surely knows what he’s talking about.) We need to refocus away from a critique of his personal or moral foibles and failures, and re-engage with what matters. That means it’s time to (finally) talk policy. The other is from Nic Dawes, appeared in the Columbia Journalism Review and made the rounds, at least in the arenas I’m familiar with (it’s all algorithmic and doubtlessly intended to keep me deep in my comfort zone). Dawes is concerned with preparing American journalists for a level of hostility and restricted access they have never encountered before. The freedom of the Press and, more importantly, the importance of the Press is something that has been taken for granted in this country, and ostensibly enshrined in our founding document. It has weathered difficult times and difficult moments before, but never has it faced the total rejection and defamation that is being put forth by the President-elect and his political entourage. On the matter of the press, part of me despairs. The calcification of the federal government was at least periodically tempered by the actions of the Press (though not with anything near the level of effectiveness that was necessary). Without any voices playing even nominally playing the role of dissenting opinion or considered criticism, I fear we face a necrotic rather than a merely ailing infrastructure of governance. Most of all, fear is what keeps me up at night. If this shock, this pain, this anger continues as it is, and fear sets in long term, we will be lost. The forces of power need us divided and overwhelmed. We must imagine new ways of being, and living, and speaking that will allow us to push back against those instincts to circle the wagons and protect our own. Maybe I’ve been watching too much Supergirl lately, but it seems like this moment––when things are dark and bleak and uncertain––is when we must hold out our hands and try and help each other stand. Persistence pays off. 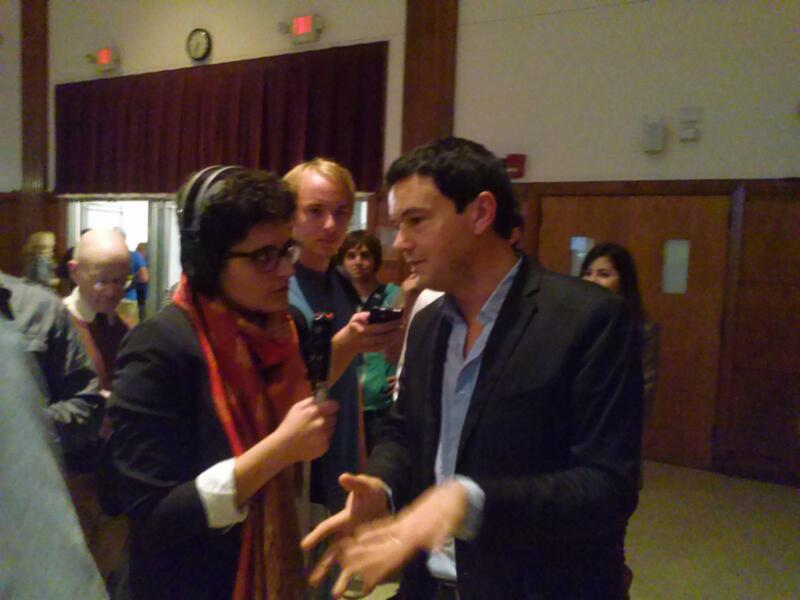 By being the most annoying reporter at the annual Phillip L Gamble memorial lecture at UMass, where French economist Thomas Piketty spoke on his book Capital in the Twenty First Century, I got to ask the first question at the press gaggle, post-talk. I had prepped about five questions, in the hopes of getting to ask more of them, but a small mob formed around the man (who looked quite tired, he had flown in the day of, and was leaving the next day at 7AM), and I didn’t manage it. But I have to say, first question for a world famous economist is not bad for student media, especially given the reception we usually get. Mr. Piketty’s book is quite substantial, it is nearly 700 pages, including the Notes, index, and other appendices. I did not manage to read the whole thing before the lecture, but I supplemented what reading I had done with every single review and criticism and adulation of the book I could find. It’s rare for an economics book to make the kind of splash Piketty’s made. Many people have, rightfully I believe, attributed the source of some of his success to the fact that the decade of research of his book were prescient for the current curiosity and frustration with the distribution of capital. Bragging rights. Photo cred: Dan Moreno. But Piketty’s book, unlike much of the conversation surrounding the “1%” at the moment, focusses less on income inequality, or the difference between what the top is earning versus what everyone else is earning in the same interval, and focusses instead on wealth inequality. The main thrust of his argument (r > g) is that the rate of wealth accumulation is greater than the rate of growth, and so capital will move towards the top of society over time, because their money is growing faster than anyone else can save theirs. His book has gotten a lot of heat, particularly from more traditional schools of economic thought. The most vicious was one in the Financial Times, which one can only read with an FT.com subscription, which Piketty responded to on the Huffington Post. What stuck out to me most, however, in his talk was his focus on the lack of real data on wealth. Because we do not tax it, the way we do income, we don’t have a solid understanding of how much money or value (not all wealth is money, some of it is resources, such as land, oil, etc) is actually there. There is no national or international collection of that data. He joked more than once during the lecture, that part of the reason for his suggestion of a global wealth tax is to help create that data. I think if I could go back and ask one more question, I would like to know how he feels being compared to Karl Marx. Another year, another set of thorny ethical questions to contend with. Specifically, at what point does journalism turn into semi-independent PR? One of the staples of any news-source relationship, be it the politician, the special-interest group, or the business, is the interview. Interviews rarely happen unless someone is trying to sell something. That something could be a new product, a new policy direction, or an event. When trying to avoid the tacit support of a particular view or party or product or person that comes with hosting them on your website/podcast/radio show/newspaper/op-ed page, is it the number of questions one asks? The kinds of questions? Do you need to treat polarized situations differently from more apolitical ones? This year we’ve seen an increase in the number of people approaching us to come on to our news show and talk about their events. On the one hand, I’m gratified, because if people are approaching us to come on our show, it must mean that we’ve started making an impact in terms of visibility. We’ve become a place you actually seek out to get a message to the people out in the world. On the other hand, I’m perturbed by the notion that we are simply a platform to promote yourself on. Intellectually, I understand that that is what many people, when representing an organization or a specific interest, view the media as. Emotionally, I end up feeling cornered by the idea that our good name can be sullied and our ethical bearing compromised by people who are looking to promote their own interests. The ethics of the situation are particularly clear, on the untried and somewhat microscopic level of the University because my fellow students have not yet become PR masters. They are clever enough to approach us to get pre-event coverage. But they are not clever enough to phrase their desire for publicity as an opportunity for my organization to get a scoop, or break a story. So I’ve taken to phrasing that last bit, where they get to talk about their own stuff in terms of, “You approached us…” carefully wording it to allow our listeners the knowledge that this is, in a sense, a contrived media moment. We didn’t get paid, we are not endorsing them, but we will allow them airtime. So far, I haven’t said a flat-out no to anyone. I think the really thorny ethical question will appear if ever I am approached by a group whose position I believe to be lacking in some kind of merit and am forced to ask should I air these people at all?. There is a tension between the “personal brand” and the brand of the larger entity one works for. It is especially true for interns. The intern has essentially agreed to work for free to “pad their resume” or, in other words, build their personal brand. For people of certain skill-sets, the “personal brand” is less important. If you’re an engineer, or a student of another applied science, you can present lab work and other concrete examples of work you have done or participated in, and be judged on that (often you already have been, if a study is published and peer-reviewed). But those who fall into a more “artisinal” category (designers, journalists, artists), people whose work is both becoming excessively commodified (“oh anyone can write/throw a webpage together/et. al.”), need a portfolio that clearly displays their skills to acquire work. With these areas becoming increasingly free-lance, it is even more critical.